Copyright �2009 PopEntertainment.com. All rights reserved. Posted: May 22, 2009. As the second season of the popular USA Network series In Plain Sight starts up, there are a lot of changes in the Albuquerque Witness Protection program. Federal Marshall Mary Shannon (played by Mary McCormack) has escaped from a kidnapping threat and now has to deal with a power shift in her office as well as a changing dynamic in her home. Her ne�er-do-well mother and sister are going through seismic life changes. Mother Jinx (Lesley Anne Warren) has finally come to terms with the fact that she is an alcoholic and sought help at rehab. Sister Brandi is coming to terms with her criminal past as well, feeling guilty for playing a big part in her sister�s getting kidnapped. Mary�s sister Brandi is played by Nichole Hiltz, an actress who is using this as her breakout role after recurring parts in Bones, Desperate Housewives and The Riches. Joining the series is veteran character actor Joshua Malina � who co-starred with series lead Mary McCormack on The West Wing and has also had significant roles on the series Sports Night, Numb3rs and Big Shots. Malina plays Brandi�s new love interest Peter Alpert, a well-off businessman who heads a local Alcoholic Anonymous group. As In Plain Sight returns for a second season, Hiltz and Malina were nice enough to do a conference call with us and several other websites to discuss their show. My first question�s for Nichole. What about your role continues to challenge you? Nichole Hiltz: A lot of things this year. Brandi is trying to change her life, but she doesn�t really know how to do that overnight. So she�s still getting into trouble and challenges and bumps. It doesn�t help that my mother is asking me to go to AA meetings for her when I�m trying to get my own life together. It�s challenging because she wants to be better and doesn�t really have the tools to be that yet. Joshua Malina: I really felt welcome right away. It was nice that I knew Mary McCormack already and it was fun for me right away. Nichole is a blast; I certainly liked her right away. I can�t speak to whether she felt any chemistry, but right off the bat, we were laughing. Our very first scene we were shooting outside on a bench and it was really cold. There was the instant camaraderie of how do we act not cold? How do we do this scene without shivering? So yes, I hit the ground running. Everybody there is very cool. 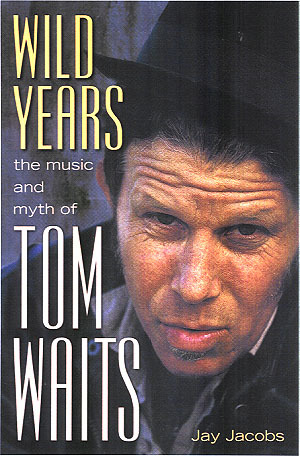 I had done a play reading with Fred Weller; I kind of knew a few people and that�s always nice. It�s also very, the vibe on the set from everybody on camera and behind the camera is pretty relaxed. It�s a very cool place to work. What got you started in acting, for both of you? Joshua Malina: I�m going to let my TV girlfriend go first on all mutual questions. I�m a remarkable man and I need time to come up with something. Nichole Hiltz: Well, Punky Brewster inspired me a lot, loved her. Nichole Hiltz: I was always in love with film and becoming a character and playing something else and nobody ever told me no so I just followed it and here I am, having a ton of fun. Joshua Malina: Actually it�s pretty similar for me, too, always wanted to be an actor. It sort of prevented that whole; I never had any of that kind of angsty period where I was trying to decide what I wanted to do with my life. Ever since I was a kid, probably eight years old and doing musicals at camp and community theater and plays at school, it was just always what I most enjoyed and always what I intended to pursue. I went to college and I majored in theater and then never really too seriously considered doing anything else until recently where I have a wife and child. I think it�s too late now; I have no other skill set. Nichole Hiltz: You�ve got a couple. You�re good at smacking the signs out of my hand. Joshua Malina: That�s true, but there�s no money in it. Nichole Hiltz: I can start paying you if you want. I�ll pay you to stop. How did you two get your parts on the show? Did you audition for them? Nichole Hiltz: I�m not going to speak for Josh, but I don�t think he did. I auditioned several times. I had to go through the network test and all that, but I think Josh might have just charmed the pants off of everybody. Joshua Malina: Speaking for myself, these days any time I�m working it�s almost guaranteed that I haven�t auditioned. One way to ensure that I�m not going to get a role seems to be by showing somebody how I would play it. These days I really only work when I�ve got some sort of connection. My connection is that Mary McCormack brought up my name. I was actually delighted; I was in New York City. I had just finished doing, believe it or not, a workshop, sort of a mini production for producers of Grumpy Old Men: The Musical, which a friend of mine was trying to get done on Broadway and I was having that immediate � every time I�m done with any kind of job I have the immediate, �I�m never going to work again,� moment. As I was reveling or wallowing in that �I�m never going to work again moment,� I got a text message from Mary saying, �I think they�re going to offer you an arc on my show.� Shortly thereafter I did. I was really delighted to get the part. Nichole Hiltz: I was delighted to have a TV boyfriend. Then I was delighted to find out it was Josh Malina. Joshua Malina: My memory is I heard you mutter, �Aww,� under your breath. Nichole Hiltz: That�s the opposite of what happened. Joshua Malina: Maybe that was just in my head. Nichole Hiltz: Lesley Anne Warren made fun of me because the first day you showed up, she�s like, �Why are you acting crazy?� I said, �I�m not acting crazy; I�m fine.� She�s like, �No, you�re acting like a weirdo.� I was trying to be nonchalant. Joshua Malina: I was delighted. I was checking out the forums on the show�s official site and I noticed a lot of fans hate your character, Nichole � and Jinx as well. I was just trying to figure out do you take that kind of thing to heart or is it confirmation that as an actor you�re playing Brandi perfectly? Nichole Hiltz: I want to go with the second. It is challenging. It�s hard sometimes to play; I know already in the script that she�s screwing up. How do you back this up and how do you fight for it? But I had to learn quickly not to take it personally. It makes my character more complex and it�s something to fight against and makes it more of a challenge. Sure everybody wants to be loved, but they�ve given me such great stuff this year, the stuff with Josh, has been really, really fun and has brought a lot of integrity, I think, to my character. Thanks, Josh. At the same time if every character is perfect and always doing everything right then we don�t have a show and it�s not as interesting. It balances out. Joshua, what�s your personal view of Peter? Is he somebody you�d want to hang out with? Joshua Malina: That�s a great question. I think for at least the first two or three episodes Nichole and I would talk about I was just called Mr. Bummer, like what is that? My god, a self-righteous recovering alcoholic. That being said I like people like that; I enjoy hanging out with people who are a huge drag. That�s just me. The greater overview as David Maples and the other writers have written him, I actually think there�s a lot to him. I think he is the kind of guy I�d like to hang out with, in part because I think we�ll discover he�s got a lot of money, too. Maybe I�m not supposed to say that. I certainly enjoy hanging out with the rich. To be more serious now about answering your question, yes, I think there�s a lot to him. When we first see him it�s in a very specific situation. The guy�s at an AA meeting and this really cute girl crashes it, tells this amazing story and then he immediately finds out that it�s all a lie. So we�re not seeing him at his happy best. He�s definitely feeling kind of taken advantage of and sort of bummed out. What I can promise is that we�re going to see these guys start to enjoy each other more. Brandi is probably more interesting a character than anyone other than the two actual leads in that she�s struggling to grow and she keeps slipping. Now the big changes in her life have mostly come as a result of the last few episodes of the first season and this first time she attended an AA meeting. Could you speak to how you think those particular events impacted her and how it relates to the way you play her through those? Nichole Hiltz: Do you mean since the AA meeting? Nichole Hiltz: Starting, I think, last year it�s huge and what has been interesting about Season Two is that we pick up right where we left off. So we don�t, Brandi does apologize, but I think she�s still dealing with her boyfriend�s death. I�ve really screwed my sister over several times now and I think she�s had enough. I think she�s scared, but she doesn�t really know what to do. What I love about the way she stumbles upon the AA meeting; I�m really trying to go to bat for my mom. She�s alone a lot and the reason she gets in a lot of trouble is because she really doesn�t have her own life. She doesn�t have a job like Mary. She�s one of those people who isn�t really; she doesn�t have anything that she loves so much to keep her out of trouble so she keeps either fending for her mom or hanging out with, back in the days of bad boyfriends, finally get a good boyfriend even though she doesn�t know it yet. I love that she has stumbled upon something that makes her grow sort of by accident. She�s not going to some self-help group and going, �Yes, I�m going to do this, I�m going to turn around.� It�s sort of happening to her just from life and I think that�s the way real life is. It makes it sort of sweet, very magic. It�s fun to get the script because I don�t really know what�s going to happen. It�s been amazing to play. Josh, you kind of got a reputation for playing a smartest-guy-in-the-room kind of character, however much or little influence they might have on what�s going on. With Peter there�s also now empathy. He really feels for Brandi when he thinks she�s Jinx and it�s really apparent. Now there�s this process where he has to deal with her lying and her apologizing and how does that affect the way you play the role? Just as a sidebar have you been giving poker lessons to the cast and crew yet? Nichole Hiltz: I love that he just said that, love that. Joshua Malina: I try to rope people in. I�ll go to the first part first. Yes watching the episodes I feel like the character�s kind of a different vibe, a different energy from a lot of what I�ve played thanks largely in part to Aaron Sorkin casting me so often. I think you�re right. I do have this rep as playing these kinds of lawyers and policy wonks and smart guys; I usually don�t like to do interviews because I�d rather leave the illusion that I am as smart and good as Aaron tends to make me. Nonetheless this guy�s a little bit of a different feel. Peter is kind of a little bit more low-key. I like the departure and I do like the story. I know where it�s going to go. I like that he sees, first he thinks he�s seeing Brandi for who she is as an alcoholic struggling with it, but even recognizing the lie and originally reacting rather badly to it and not taking it very well, understandably. He�s eventually going to see something in her that he�s really attracted to. I their two other characters are not on paper people you�d necessarily expect to be drawn to each other, but they both see something in each other that�s actually pretty nice. As for poker I think I�ve attempted. I don�t think I�ve gotten anyone to actually play on this set. I�ve been talking to Cristi�n about trying to put together some sort of; I produced Celebrity Poker and it is a last memoir. We�re going to talk about doing something somewhere else, possibly in Chile. Poker lives and my hopes for it. Between last season and this season, what was your most memorable scene? Nichole Hiltz: Last year I really, really, eleven and twelve were great episodes, I think, for the family altogether, but I, it was a very small scene, but I got to do this scene with a baby, another point where Brandi starts to change a little bit and I really loved it. The writing was really heartbreaking and it sort of gave me a connection to my sister that we don�t get to hear her say. It sort of happened out-loud in this experience. That was my favorite of last year. This year my favorite is with Josh. It has, all of my favorite stuff has been story lines with Josh. I love the AA stuff for sure and I can�t really talk about the things I love more because they haven�t been seen yet so I�m sorry, but it�s our stuff. The chemistry has been really great and like Josh has said, these characters are so unlikely and yet so, so perfect for each other in sort of an ironic way. Joshua, how do you keep your skin so nice? Joshua Malina: I�m glad you asked. What an odd question. But for me it�s just constant care; you�ve got to really wash it nicely and for me, it�s also the use of Dermalogica products. Come on, Dermalogica, send me a crate. Nichole Hiltz: You know he wears makeup, right? Joshua Malina: Only on camera. Josh, I�ve only seen the first episode that you�ve done so far, but I know that for the character, AA is such a vital part of his life and his recovery. Did you visit any AA meetings or talk to any members to prepare for that? Joshua Malina: That�s a good question; I wish I had a good answer to it. The short answer would be no. But let me expand on my no and defend it. I certainly have, I�ve got friends and people I know who are in the program and others who ought to be so I feel like I know the world fairly well through that. Also a combination of inclination and laziness; I�m the kind of actor who�s very much let�s see what�s on the page. I�m not like the big back story research guy. When the writing is really good as I�ve been lucky to have, to do a lot of good writing and David Maples� writing is terrific. I�m all about the text and it�s usually all there on the page and my approach to acting is the character is the guy who says those things in the script I was just given. So unless it�s very specific stuff that really needs to be researched for me I�ve got to find it in the dialogue. Speaking of the dialogue, Nichole, I thought that Brandi�s speech at AA exposed a lot about the character. What do you think she was trying to get across and what do you think she let out without meaning to? Nichole Hiltz: I�m not sure that she was trying to get anything across at all. I think when Peter asks her to talk all she�s thinking is I just want to get that card signed for my mom so I can be the dutiful daughter. So I think when she first gets up there she�s kind of having fun with it. People are clapping and she thinks she�s just going to amuse herself and make up a little bit of this speech and try to get by. She becomes nervous and had just heard Peter�s story that was open and touching and I think it just happened for her because she�s been carrying all of this around between all the stuff that she�d gone through last year. Now she�s in this room that�s open and listening and I don�t know that anybody�s ever asked her if she�s okay or what�s going on. So I think it�s a surprise to her. When we go to the park later she�s like I can�t believe I flipped out like that. I love the way that scene was written. It almost came through her as opposed to something was at all contrived. So it was innocent and I think, kind of realistic in a lot of ways. Following up on the whole alcoholism storyline for both of you. What I�m really wondering more for Nichole is are we going to be seeing her go to more AA meetings or is that pretty much done? I guess I want to see if that�s going to be pursued or if she thinks she might have an alcohol problem, too. Nichole Hiltz: I don�t think so. Brandi�s certainly not on the straight and narrow, but even the problems, she would never, we haven�t seen her necessarily be an addict. Something like Al Anon would be a little bit more appropriate for her. The problems in her life aren�t necessarily substance abuse. I think it�s all the emotional things in her life and her family that she can�t figure out and doesn�t have the tools to understand it or see the big picture. It�s going to be more dealing with Jinx�s recovery I think. I don�t know that it�s Peter and Brandi�s relationship becomes a little bit less about AA and more about two people who can open each other up, open their eyes up to different things a little bit. If you knew somebody who wanted to get into acting as a young person, how would you recommend they start now? What steps should they take? Nichole Hiltz: Go ahead, Josh. Joshua Malina: Okay I�ll open. I actually have, in all seriousness, in the back of my mind someday to write a book, the title of which would be Quit Now and Other Practical Advice for the Aspiring Actor. My opening salvo would be, �For the love of God, do you have any other interest that you could pursue?� That being said, were the young person still passionate about acting I would say the best thing to do is not focus on really whether you�re going to do it as a career. As a young person I would say just do it as much as possible. Do community theater; do your school play, find an after-school acting thing. Now everybody�s got a video camera so go make videos with your friends or see if you can get a part in a film school thing that�s being done. Basically just do it a lot because one, you�re going to first of all improve. Two, you�re going to discover whether you really do have the drive to pursue it as a professional and three, this was very good advice given to me when I was younger: you�re going to meet the people who are going to turn into the directors and the writers and the casting people and the producers of the next generation. So really doing as much as possible on whatever level with your contemporaries I think is the best way to pursue things. Nichole Hiltz: And I can agree with everything that Josh just said and it�s a very good point. If you don�t love it then you shouldn�t; you have to beyond really love it to really do it, but you can�t figure that out, I guess, until you try everything. If you only do it half way, I loved it so much when I was younger and I was lucky enough early on to have maybe somebody give me advice. But even when I was in school everything I did was so I could afford to come to L.A. and try this out. I just saw red and focused quite a bit. If you were placed in the witness protection program yourself, where in the world would you like to be located and why? Nichole Hiltz: That�s so unfair because I don�t think you get a choice. Mine would be tropical for sure. I don�t think I have to explain why, but I don�t know that that happens. Otherwise I really want to be in witness protection. Joshua Malina: I�m thinking Israel because I would just blend in with my fellows Jews, Jews, Jews. I think I would be safest there. Ironically, safest in Israel. What do you feel it is about a show like In Plain Sight that resonates well with viewers? Nichole Hiltz: I think for one it�s found a way to be very funny and sometimes very dark and very real and it has that great combination. The characters are all so, so different. I think families can tune in together and the fans seem to really get into it. So that helps. Joshua Malina: Speaking as a fan before I was on the show I would say definitely the cast; it�s got a fantastic cast and you kind of care about everybody. It�s got a pretty wide selection of characters. You�ve got Mary�s home life and her professional life. It�s pretty compelling. It is funny at the same time. I think Maples has created a compelling and interesting world. The first season we saw you being the �bad girl.� And since that you�ve been trying to come back. You fall a little bit, but you�re trying hard. As the actress playing the role, which would you rather do? Would you rather have Brandi just fall back and always be the bad girl or would you rather have her keep trying, but not necessarily making it? Nichole Hiltz: I don�t want to always be the bad girl and I don�t view her as the bad girl. I can�t come from a place like that. She�s a girl who gets into trouble; � just have a different life than some of the other characters. It is so much more fun to play somebody who�s growing. If she was always, always in trouble and didn�t make any steps forward it would be exhausting. As an actor some of the deeper stuff to play is when you fall down so I get more interesting scenes when she does sometimes, but it would take quite a toll at the same time. I cheer for her when she does right and I fall into a bit of a funk sometimes when she goes back. No, I think people, you don�t change over night; she�s not going to become a completely different person. I think she�s always going to bump her head on the wall, but hopefully just less often and eventually get there like people do. Except for if you�re Josh Malina then you get to be right all the time and you�re perfect. Joshua Malina: It�s not easy. Nichole Hiltz: No it�s not. Josh, my question for you is obviously you can�t say what happens in the future of this role, but in the scope of you playing it, you said you don�t do a lot of research. But in the scope of how you play this role, do you play it like it is only for a few episodes or are you playing it like you�re here for the duration along with the rest of the characters on the show? Joshua Malina: Definitely the latter because God knows I want to be around. There is that concern sometimes about giving that guest star performance � I�ve got one shot at it; I�ve got to make this a very special episode of In Plain Sight. So I�m trying to lay down a fairly low-key performance with this guy so he seems like a realistic guy who lives in this world and is in Albuquerque and interacts with these characters. Without giving away too much I can say that I was delighted that in the final script I did not walk into an open elevator shaft and die. My hope is, although I don�t know whether my hope, my dream, will be answered, but I hope I may, in fact, appear at some point next season. 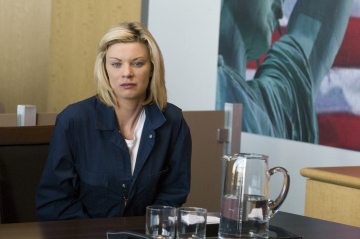 Nichole Hiltz: It�ll break my TV heart. Of course you�re back; they can�t do that to me. So what�s your favorite part about being on the show, both of you? Joshua Malina: For me it was pure fun. As I mentioned, it came out of the blue as a text from Mary McCormack, one of my favorite people in the world. So it was really along the lines of, �Do you want to come play in my sandbox?� It was a pure delight for me, completely unexpected. This came out of the blue and then happened very quickly and all of a sudden I was shuttling back and forth to Albuquerque with Nichole, whom I love, and all these nice people and great material. So for me it�s just pure fun. I like working altogether and being an actor. With my career there�s a lot of downtime. So just having a job is a wonderful thing, but when it�s good material, which is rarer still and good people and the set is relaxed. I literally would just fly out there and play with my new friends and fly back home. So the whole thing�s been a joy for me. Nichole Hiltz: For me I have to say that I have to give a huge shout-out to David Maples because I didn�t really know what Brandi would be or to come. At first it was just wonderful. I learn a lot on this set and from Mary and from Lesley. We have great guest stars, some really great guest stars this year and new directors every week. But I am very lucky to David Maples, who�s so good at writing for his actors and he can take something that; I think he actually steals from my real life sometimes and then tries to put a different story on it and knows what will touch me or what will be fun. I feel very taken care of that way. The writing gets bigger and grows and that�s a huge gift as an actor. He�s not putting her in a box and he�s letting her grow. That�s been the best part for me. From what do you draw your inspiration and the portrayal of your characters? Joshua Malina: Both of us? Joshua Malina: Again and I know this is such a lame answer, but it�s a really candid answer. It�s from the scripts. When the writing is good it�s all there. Usually if I find myself trying to dig around with, �What was this guy like as a kid? Why is he here now?� It�s usually because that stuff isn�t baked into the dialogue. When the writing�s good I feel like it�s usually there. I don�t have to go hunting around for inspiration. David Maples and I had exchanged a few e-mails where he kind of described who the guy was and where he was at at the opening and where he thought he�d take him. I was delighted to see when I got the final material that it�s kind of just all there on the page. When the writing is good that�s all the inspiration I need. Nichole Hiltz: For me especially with this show it�s a thousand percent in the writing. We had to do a lot of that work last year when we were on the pilot and getting on our feet as any new show, figuring things out. At this point it�s, I sometimes read the scripts and cry and immediately laughing and I already know. It�s easy for me to stay, not stay, but pick her back up from last year. You don�t have to do a lot of work with this writing. I shouldn�t say that, maybe I won�t get paid anymore. Nichole, how do you think things would have panned out if it were Brandi that killed Chuck instead of Mary? Nichole Hiltz: If it didn�t go down the way it did and everybody survived and just became a murderer and on my own killed him or if it happened the way it went for Mary in a kidnapping situation? Yes if you became a murderer basically. Nichole Hiltz: That�s another whole avenue. I guess if I was avenging my sister then I�d be in a whole different load of trouble, but I think she actually does mean that. I think if she didn�t know the way things were going to turn out; Brandi�s not somebody who always thinks the entire situation out. I think I�d be in jail so I don�t know. I�m glad it happened this other way. It�s shocking that she would get a second chance at all so I do have the opportunity to see her unravel and how she grows like that. I�m not sure really, it scares me. Especially about Brandi murdering people. I�m curious, will Wanda be in the next Trailer Park Boys movie? Nichole Hiltz: So far no offers; I don�t think so. I did have fun working on that and I wish them all the best of luck; it�s a fun show, fun film. Thanks for asking. Nichole, Jinx has such an interesting storyline. What is Lesley Anne like to work with? Nichole Hiltz: I love working with Lesley. We�re together a lot; we get a lot of scenes with just the two of us. She�s an actor�s actor. She loves to talk about the scene. She loves to do deep emotional work. She�s been supportive. We help each other out, but she really helps me out if I�m struggling sometimes. She�s supportive and she�s actually really fun. I look forward to seeing her; I miss her when she�s not in episodes. It�s been a real treat getting to work with her. Joshua Malina: Can I toss out a Lesley Anne moment? Joshua Malina: I had a great moment with her. My sister likes to buy me these fantastic, I�m going to give a shout out even to the Web site, the Web site�s on threadlist.com. They make these really funny novelty t-shirts, a lot of which are nostalgic. My sister�s constantly sending me these t-shirts. I have one that�s from Clue, the game and the movie. I think it says, �It was Miss Scarlet with a revolver in the study,� or something like that and I was wearing it on the set as we rehearsed. Nichole Hiltz: I missed it. Nichole Hiltz: I thought you wore it on purpose. Josh, like you mentioned you know Mary from The West Wing and I was seeing that Richard Schiff is going to be on the show as well. Any other former West Wing people going to be on the show that you�ve heard about? Joshua Malina: That�s a very good question. I think slowly one-by-one I guess everyone. We should be able to get a Dul� Hill guest star. He�s already working for USA [in the series Psych]. I think it�s all a very nice reflection on Mary, who likes to bring us in and play with her old friends. But I did see Richard, I don�t really get to interact with him on camera, but I did see him. We are in the same episode. It was really, really nice all to be together. It was fun for the three of us. What�s the hardest part about working on the show for the both of you? Joshua Malina: I�ll go first. Acting�s so damn easy. That�s probably a secret and I�m not supposed to say. Actually that�s we both have to pause like hmm the hardest part. It�s the easiest job in the world. That being said for me I�m married and I have two kids and the show shoots in Albuquerque so there�s a lot of back-and-forth. For me it�s the traveling, getting out there and being away from my wife and family although they enjoy eating and wearing clothes so they understand that Daddy has to work. Nichole Hiltz: You stole my answer. The most difficult part; it�s hard being away from home. I don�t have a wife and kids, but it doesn�t matter. Maybe some day I�ll have a wife and kids. I was out there for a good five months. It�s not that it�s so hard being there, but your life at home doesn�t stop either so you miss family and friends and you feel like you�re sort of balancing two lives at the same time. I love submersing myself in the show and being out there. I always think I�m going to read so many books and I�m going to get so much done when I�m in Albuquerque and it just never happens that way. Things really are still busy. Thank God it�s an hour-and-a-half away. Thank you Southwest. Josh, you mentioned earlier about being a fan of the show. This is for both of you. Do you watch your performances after the fact? Do you sit down and watch the episodes or is that hard to do? Joshua Malina: My answer is early on in my career, watching myself was a highlight. I was like, �I�m going to be on TV,� or �I�m in a movie.� Couldn�t wait to see it; couldn�t wait to watch it multiple times. I don�t know why, but that is not so much the case any more. Maybe it�s watching myself age onscreen is not something I�m too interested in, but somewhere mid-West Wing I started to realize that the show coming on; I was always excited that a new show was airing, but I didn�t really feel like watching it. And I think it�s one of the things where I just turned into one of those actors where I watch it and I�m like, �Why did I do that, why didn�t I do this?� Everything is usually just like, �I thought I was better than this.� That being said I did go ahead and avoided it for five days, but having Tivo�d it I sat down and watched the first In Plain Sight that Nichole and I had and I really enjoyed it. I was very happy with the whole thing so that was a rare, these days, surprise. Nichole Hiltz: I�m the same way; I�m actually more judgmental of myself as I get older and as I see it more. With In Plain Sight I do sit down and watch them; I actually get very excited because what�s been a lot of fun about playing this role and then some of the show is that I don�t really know what Mary does for a living and even though I�ve read the scripts, my character isn�t on the set for any of that. So half the show is completely new to me. I love watching Mary; I love watching all the WITSEC stuff and then I sort of know that my scenes are coming. I hate the moments where I trusted myself to on set feel like I know if I�ve done a good enough job or I knocked it out of the park and then I sometimes watch it and it�s the same thing, �I thought I did better than that.� I have a really hard time watching my own mannerisms, things like that, but endpoint is I do sit down to watch because I�m rooting for the whole show and I love watching all the other actors and to see them on-set and embrace and love them, but I don�t get to always see their work. This question is for both of you. If not acting, what would you be doing? Joshua Malina: Modeling skin care products. No, enough of that. Do you have an answer; do you want to go first? Nichole Hiltz: Either that or a rock star, but I�d have to see if I was good at it. I have no other skills. This is the hardest question you could ever ask me. I�m not good at anything else any more. I put all my eggs in one basket. I�m good at being fun. Joshua Malina: Are you done? I don�t want to be rude. My standard answer is that I would be a novelist. I never possibly actually could, but I�m a big reader and I�m always blown away by novelists and their ability to create entire worlds. That being said I never could actually so a more realistic answer, I think I would still stay in the business as maybe a screenwriter or a TV writer or something like that. What would your ultimate dream role be both of you? Joshua Malina: Good answer. My ultimate dream role was Chaplin, but Robert Downey, Jr., played it already. And he was great. Joshua Malina: So he doubly ruined in my dream by actually executing it and being better than I ever would have been. So it�s over, I�ve moved on. My new dream role would be to play Groucho. I�m a classic comedian fan, what can I say? Nichole Hiltz: I�m learning a lot about you. 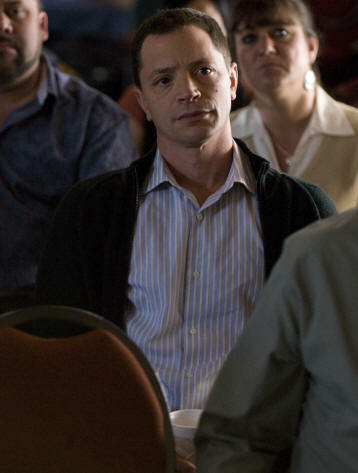 Joshua Malina: I�m old; you knew that. What�s been your favorite role that you�ve played so far? Joshua Malina: That�s a tough one. I�ve got to figure out what writer/producer I�m willing to alienate. Nichole Hiltz: What show am I not coming back to? Joshua Malina: It�s hard to say, but I�ll go for it anyway. I think for me it might have been Jeremy on Sports Night, not only because it was an incredibly great character that Aaron created, but that combined with the fact that it was my first major TV role and I was just a couple years married and my daughter had just been born. The entire experience of playing that role and having that show and the time in my life when it occurred I think made the whole thing kind of a special golden memory. Nichole Hiltz: I have to say and not because we�re on this conference, but how can I not say Brandi? This whole show has been pretty life-changing altogether. I�ve gotten such good stuff, such good writing. In addition to that I did a movie, surprisingly called Trailer Park of Terror that had been; it was so great to play because I got to be a comic book character so had that aspect of it. I got to play sort of three roles in one. It�s hard to explain if you haven�t seen the film. It was great; it was great for a female. You don�t get a lot of opportunities like that. Brandi and Norma, my favorites. Would either of you ever be interested in writing or directing for the show if you had a chance? Nichole Hiltz: I could not handle that pressure. I love getting my script like it�s Christmastime and it�s a gift playing it. We�re doing so well why would I ruin a good thing? Maybe something different, but not In Plain Sight. Joshua Malina: That would be my answer as well. I do write things; I never do anything with them, but I think I am on the verge of possibly selling and producing a Web series that I wrote, but it would be different in tone, more kind of surreal, madcap if you will, comedy. I don�t think I could write an In Plain Sight. Nichole Hiltz: I�m not genius enough like David Maples. Joshua Malina: Exactly. Did you hear that, David? We called you genius. Nichole Hiltz: I said it loud; he can hear it. What�s the name of your Web series so if you do put it out there we�ll know about it? Joshua Malina: It�s currently, we�ll have to see whether the people putting up the money will allow it, but it�s currently called �Backwash,� which is a lovely �. Nichole Hiltz: Tell me more. Joshua Malina: Thank you for asking, Nichole. I call it �Backwash� largely because I like that phrase. It�s kind of icky and memorable, but for the press, I can give you an explanation, which is backwash is that final sip at the bottom of a can of Coke or the bottom of your drink, which, though tasting vaguely everything that came before it, is nonetheless its own thing in its own right. And that is my explanation. Nichole Hiltz: And this is why you get cast as the super intelligent guy all the time. Joshua Malina: Or the guy who makes no sense. Nichole Hiltz: Or deeper than I thought. CLICK HERE TO SEE WHAT JOSHUA MALINA HAD TO SAY TO US IN 2003! #1 � 2009 Gregory Peters. Courtesy of USA Network. All rights reserved. #2 � 2009 Gregory Peters. Courtesy of USA Network. All rights reserved. #3 � 2009 Gregory Peters. Courtesy of USA Network. All rights reserved. #4 � 2009 Gregory Peters. Courtesy of USA Network. All rights reserved. #5 � 2009 Gregory Peters. Courtesy of USA Network. All rights reserved. #6 � 2009 Gregory Peters. Courtesy of USA Network. All rights reserved. #7 � 2009 Gregory Peters. Courtesy of USA Network. All rights reserved. #8 � 2009 Gregory Peters. Courtesy of USA Network. All rights reserved. #9 � 2009 Gregory Peters. Courtesy of USA Network. All rights reserved.